With the advent of the industrial age, asbestos’ unique properties, including its resistance to fire, tensile strength, softness and flexibility, resulted in its widespread commercial use. Decades later, its usage was shown to have tragic medical consequences, as these fibrous minerals became causally linked to malignant mesothelioma and other debilitating diseases. Malignant mesotheliomas are aggressive tumors that arise from serous membranes, such as the pleura and the peritoneum. Mesothelioma has a dismal prognosis due to its inherent chemo- and radio-resistance as well as to the general ineffectiveness of surgical intervention. Mesotheliomas account for approximately 3200 deaths per year in the USA, with more than 450,000 deaths predicted over the next 40 years in the USA, Europe, Australia, and Japan. Legal compensation alone is projected to amount to hundreds of billions of dollars worldwide over this time span, and this already enormous figure does not include health care costs. Currently, about 125 million people worldwide are exposed to asbestos in the workplace. Given such continued exposure to asbestos fibers, there is thus great public, medical, and legal interest in this malignancy. 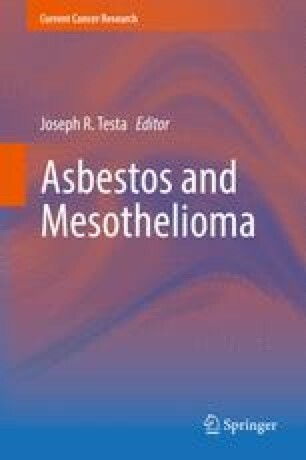 This introduction provides a general overview of the mesothelioma burden and a brief outline about the contents of this monograph, which includes a multidisciplinary assessment of the characteristics of asbestos along with the epidemiology, cell biology, pathology, and treatment of mesothelioma. Psychological aspects and legal challenges facing mesothelioma patients and their families are also presented. The Editor is grateful to the many talented laboratory colleagues and collaborators he has been privileged to work with over the years in a collective effort to unravel the pathogenesis of mesothelioma. He gives special thanks to Fox Chase Cancer Center, NIH, and the Local #14 of the International Association of Heat and Frost Insulators and Allied Workers for their sustained financial support over the last three decades.